OCTOBER 1, 2018 – The VMET (Verification of Military Experience and Training), or DD Form 2586, documents and verifies service member military experience and training. Therefore, it is useful when you are considering civilian occupations related to your military service, as well as in translating military terminology and training into civilian terms. The VMET form is available to all eligible departing service members, including those in the National Guard and Reserve. 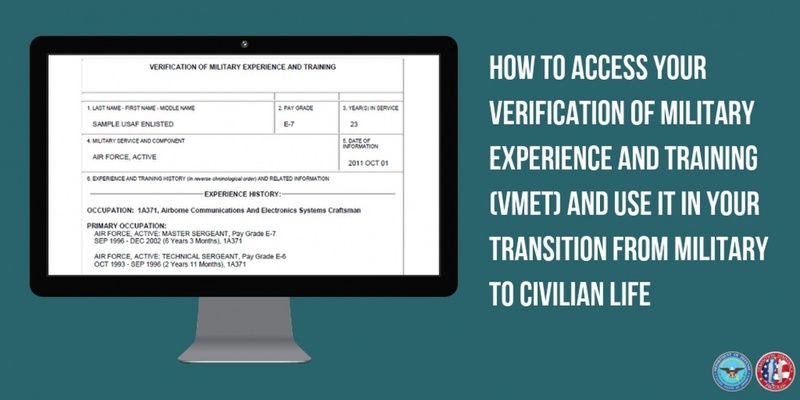 Although VMET is not an official transcript, it assists you in verifying your military experience and training to potential employers, helps you write resumes, interview for jobs, negotiate credits at schools and identify credit recommendations from the American Council of Education (ACE), and obtain licenses and certificates. To access your VMET, visit DoDTAP.mil and log on with your DoD CAC or DS Logon (Upper right toolbar, yellow box, “Login to DoDTAP”). Click “Service Members and Veterans” (the blue box). Click the green “Sign In” box in the upper right corner. Click on “Correspondence/Documentation”, and then click on “DoD Transition Assistance Program”. Select the VMET Document (DD-2586) or Cover Letter and click “Submit”. You should download your VMET at least 120 days before you separate. Since there is a quarterly update cycle on VMET, you should download the document again before you transition so you have time to make corrections if you find errors. Need more information regarding your VMET? Contact your installation’s Transition Assistance Program Office.